Bangladesh’s ambassador to the U.S. on the recent elections in Dhaka and Chittagong. Bangladesh has suffered through two successive years of intermittent violence and disruption perpetrated by its leading opposition Bangladesh Nationalist Party (BNP) and the BNP’s extremist ally, Jamaat-e-Islami. In January of last year, the BNP-Jamaat combine tried to undermine the national elections by boycotting them and engaging in months of strikes, coupled with arson attacks and petrol bombing that killed more than 100 people. On the one-year anniversary of the 2014 elections, the BNP-Jamaat alliance launched a three-month spate of strikes and violence, resulting in an additional 100 deaths. Despite this, the atmosphere in the run-up to recent city elections in its two biggest cities – Dhaka and Chittagong – was hopeful for the first time in years. Through the persistent and patient efforts of the government, the BNP looked like it would take a step toward rejoining the country’s democracy. Its leaders agreed to participate in the city elections. Violence had finally subsided. The government and Bangladesh citizens, weary of the work stoppages and arson campaigns, were hopeful that the city elections would be the first step toward the BNP’s return to peaceful elections and eventual participation in the 2019 national election. Sadly, it wasn’t meant to be. Halfway through the polling on election day, April 28, BNP candidates suddenly pulled out of the election, claiming fraud by the government and the ruling Awami League party, even though BNP candidates had already received more than 300,000 votes. This move was a surprise to the government, the country’s election commission, and even to BNP supporters who expected that the votes they cast for their candidates would matter. Soon after the election, recordings of phone calls were disclosed online in which BNP officials were heard planning the mid-election pullout on orders from BNP Chairperson Khaleda Zia. The premeditated move was designed to throw the election into chaos. The air of optimism preceding the city elections turned out to be false hope. The BNP never intended to rejoin Bangladesh’s democracy. 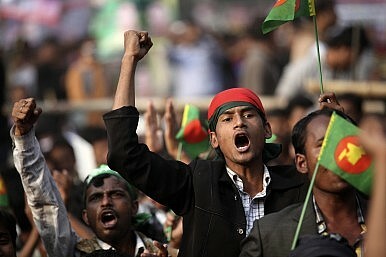 Now, the people of Bangladesh fear a return to the BNP-Jamaat-led violence. Because of Bangladesh’s history of turbulent elections, the city elections attracted intense national and international scrutiny. More than 11,000 domestic and foreign observers watched the elections. The government’s election commission credentialed 4,000 print and online journalists and 2,000 television journalists. International media outlets covering the elections included the BBC, CNN, Al Jazeera and Reuters. Turnout in Dhaka was slightly higher than in the previous election and was slightly lower in Chittagong. This was not a flawless election. The election commission invalidated 4.5 percent of the votes cast because of irregularities. The media reported disruptions at approximately 60 polling stations, or two percent of the cities’ total. Nevertheless, the election was largely peaceful. In the final tally – despite the fact that the BNP turned its back on its own supporters midway through election day – BNP candidates received 30-to-40 percent of the vote. Those numbers would have been impossible to achieve had the election been subject to the widespread vote-rigging and fraud that the BNP alleged. Neither did BNP lodge any formal complaint with the Election Commission. Despite the BNP’s pullout, voters still managed to elect BNP candidates to city council positions. If the government were attempting to freeze out BNP candidates from the election, it did a poor job indeed. The fact is that the BNP’s platforms and ideas have failed to draw many followers in the political marketplace. Instead of modifying its policies or working harder to peacefully argue for them, the BNP, like a petulant schoolboy, has taken its ball and gone home. Jamaat’s tactics have been condemned by several international organizations, including the European Parliament, which has urged the BNP to “unequivocally” distance itself from Jamaat. The BNP and Jamaat claim their campaigns of domestic terror are meant to force new elections under a non-partisan, caretaker government. Not only has the caretaker system been declared unconstitutional by the Supreme Court, it has been denounced as unfair by a number of country’s political parties – including the BNP. The government and ruling Awami League under Prime Minister Sheikh Hasina will continue its two-track policy of furthering democratic participation by all groups while maintaining the rule of law necessary for democracy to flourish. Unfortunately, it appears that the BNP and Jamaat want neither. Mohammed Ziauddin is Bangladesh’s ambassador to the U.S.
"Sheikh’s unprecedented moves since coming to power threaten to undo much of the country’s democratic progress."